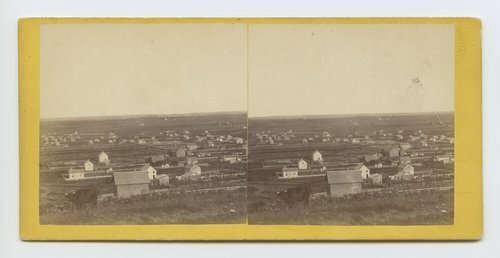 This is a stereograph showing farmland, houses and barns in the Wakarusa Valley near Lawrence, Douglas County, Kansas. It is from Alexander Gardner's series, Across the Continent on the Union Pacific Railway, Eastern Division. View in Waukerusa. [Wakarusa] Valley, Kansas. 323 miles west of St. Louis, Mo.